Should you choose EVENT or DATA? Snapizzi DATA Projects are used when you have a CSV file of subject data ahead of time to import into Snapizzi. A Data Project generates camera cards that contain the uploaded data for each subject as shown below. Simply photograph the subject's card (either Paperless or paper) and then take their individual photos. Because you have subject contact information, the cards do not need to be given to them after taking their photos. A group card is also generated and is photographed prior to taking each group photo. Snapizzi will automatically place the correct group photo in each subject's gallery. Post-processing, Snapizzi builds a Subject List for you containing all Project Data including subject codes, image file information, and gallery URLs for each subject. 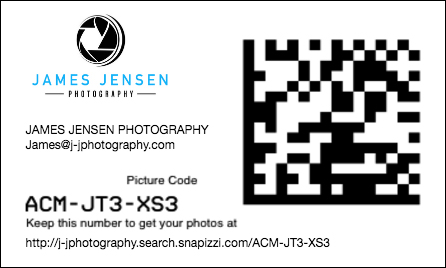 This enables you to email your customers links to their photos. If you're not sending links to your customers, you'll be able to choose how you'd like them to be able to find their photos on your Studio Search Page. DATA Projects also feature Paper Proofing and Bundles for school service items. Snapizzi EVENT Projects are used when you don't have subject information ahead of time. An Event Project generates camera cards like above that contain all the information that your customer will need to locate their photos. Simply photograph the card and give it to your subject after taking their photos. You can also customize your Data or Event Project camera cards.